aura 11/05/2012 09/05/2015 Comments Off on Why is X-Drive Faster? In this article, Oliver explains why x-drives have a higher effective gear ratio than tank drives. This seems unintuitive to a lot of people, but an X-drive robot has a higher maximum speed* than a tank drive robot with the same gear ratio. To best understand this, it helps if we consider what happens when the robot drives diagonally. Figure 1: These two drive bases have identical gearing and an identical number of motors, but drive #1 is X-holonomic and drive #2 is tank. 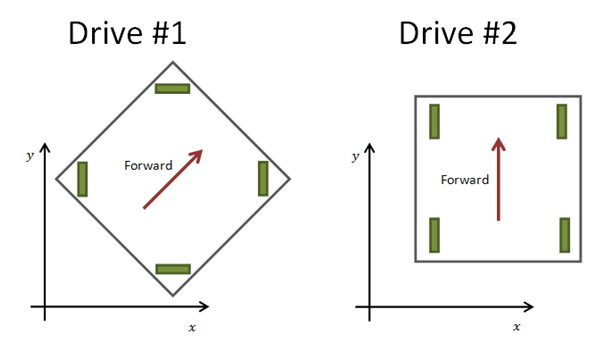 Drive #1 can move in the y direction by moving only the left and right wheels. The top and bottom wheel rollers will spin freely. In this case, it will travel at the same free speed* as drive #2 would (but with half the power, because it is only using half its motors). Similarly, it can remain stationary in the y direction and move in the x direction at the same free speed as drive #2. The amount that an X-drive is effectively geared up by relative to a tank drive is 1.414, or sqrt(2). This is the ratio of the side length of a square to its diagonal length. 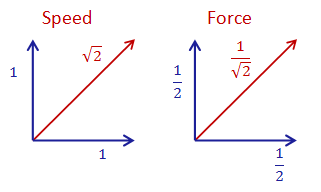 The force of the drive is reduced by the same amount because the force in each direction is half that of a tank drive and 1/2 x sqrt(2) = 1/(sqrt(2)). This means that the product of the free speed and the stalling force remains the same so in the ideal case an X-drive is not less powerful than a tank drive, it is just geared differently. However, an X-drive will usually have greater frictional losses than a tank drive because of friction between the omniwheels and the omniwheel rollers. * In this article, “maximum speed” and “Free speed” refer to the speed that the robot would travel at if its motors were rotating at their free running speed of 100 rpm. This is sometimes called the ‘theoretical speed’ of the robot, and it depends only on the gear ratio, the size of the wheels and the motor’s rotational free speed. It is different from the actual observed speed of the robot, which will also depend on motor torque, friction and the mass of the robot.